The human brain has perfected the task of performing complex functions, such as learning, memory, and cognition, in energy and area efficient manners, and therefore, it is attractive to model and replicate this performance in biomimetic systems. Applications for which such models are essential include implantable electronics that replace certain brain functions damaged by diseases or injury, and neuromorphic architectures for novel high-speed, low power computing. To properly mimic a neural function, it is important to determine the optimal level of abstraction because there are trade-offs between capturing biological complexities and the scalability and efficiency of the model. Additionally, the hardware implementation of that model must consume little power to minimize heat dissipation in order to avoid tissue damage and to allow for scaling to a large number of components. The Laguerre Expansion of Volterra (LEV) model is a promising approach since it can capture the spatio-temporal nonlinearities of a neural system at several abstraction levels. Similar to the brain, it uses basic processing strategies and operations like amplification, filtering, delay, and redundancy to produce complex functionalities. This doctoral research addresses the hardware challenges of a biomimetic system and proposes a novel method for its practical implementation. 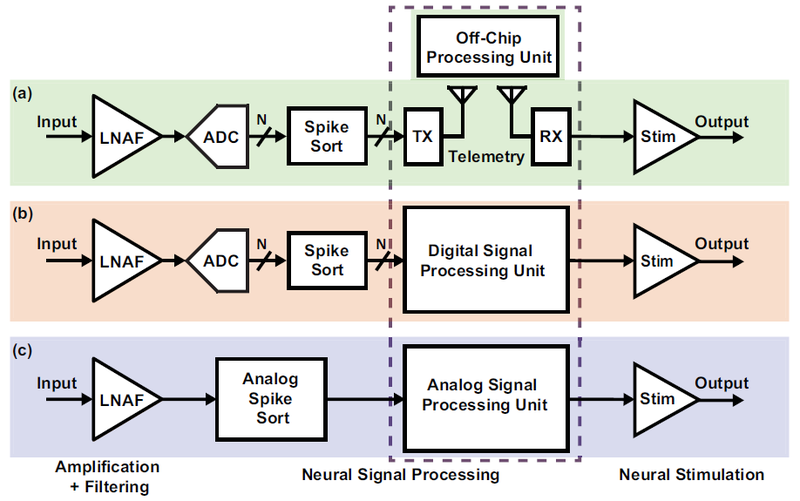 The LEV model is realized using analog subthreshold CMOS signal processing units, which are more power and area efficient than the digital counterparts. 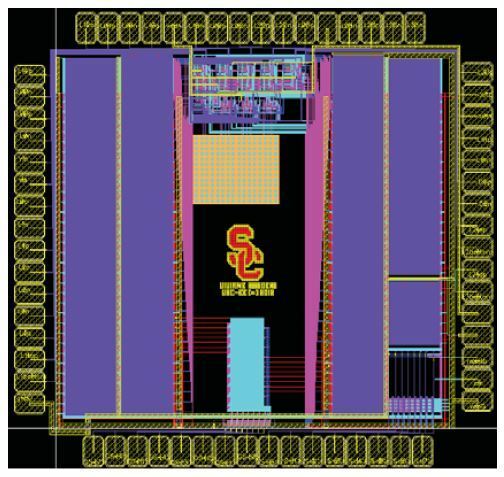 Physical layout of the LEV Chip.